We are loving this new Cobalt Blue Floral Short Dress. It features a pretty, bold floral print and cute wrap style! This dress is perfect for Summer! Casey F. Reviewed by Casey F.
Absolutely love this dress! It fit so well and I received tons of compliments. 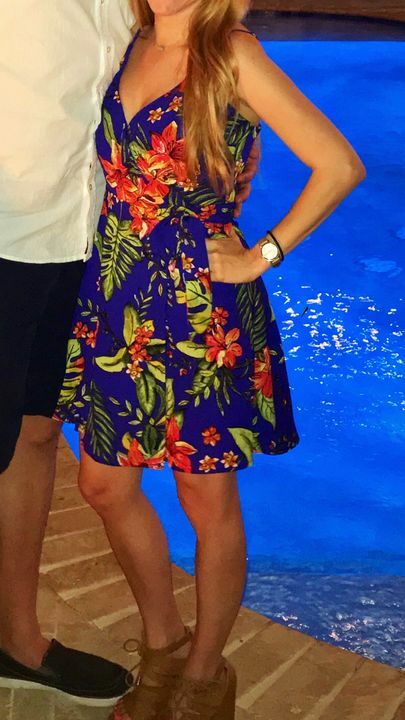 This dress is perfect for my beach vacation this weekend! It’s not too short, and I love The wrap style. The colors are perfect. This is such a cute, well made summer dress. The color and quality are fantastic. The adjustable straps and wrap-style gives you a more customized fit. I absolutely LOVE this dress. The adjustable straps help it fit perfectly up top and the length is the perfect not-too-short-not-too-long length. The colors are just as bright as they are in the photo. I can't wait to wear this!